The New Franklin / PZL 6A-350-C1R 220 HP powerplant is the most powerful Franklin engine in production today. 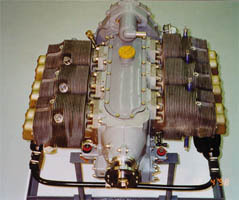 It is the latest of the six cylinder line that has been powering certified aircraft for well over 30 years. The 6A-350 is best known for its smoothness and excellent performance in high density altitude conditions. The combination of high power and light weight makes the 6A-350 the perfect engine to upgrade the aircraft to a rebuild time. The same advantage makes them the powerplant of choice for STC conversions and the new breed of high performance experimental category aircraft being built today. Engine Weight (Dry - Without Accessories) 297 lbs. Wet Slump - Oil Capacity 8.8 Qts.